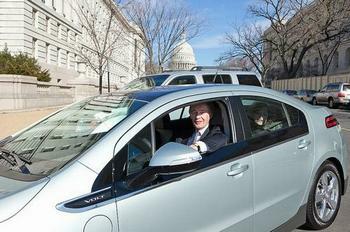 WASHINGTON, DC, May 9, 2011 (ENS) – A bipartisan bill that would award $4 billion for manufacturing and deployment of electric vehicles in 10 U.S. communities has been introduced in Congress. Ten selected communities would each receive up to $300 million to serve as domestic hubs for EV manufacturing and deployment, as well as proving grounds for best practices. The bill also offers consumer incentives for the purchase of EVs, promotes utility modernization to accommodate EV deployment, provides assistance for the installation of charging infrastructure, and encourages domestic production of EV components. The legislation recognizes that EV infrastructure challenges are complex, requiring flexibility and adaptation in different regions said its sponsors: Republican Judy Biggert of Illinois, and Democrats Ed Markey of Massachusetts, and Jerry McNerney and Anna Eshoo, both of California. Biggert said, “If we’re ever to break our addiction to expensive foreign oil, we’re going to have to give a jump start to sound alternatives,” said Biggert, who serves on the House Committee on Science, Space, and Technology. “Consumers want to enjoy a cheaper, gas-free commute, but they need to have confidence in their access to things like charging stations, and the Electric Drive Vehicle Deployment Act will put us on the fast track to electrification,” she said. “In my home district, researchers at Argonne National Laboratory are leading the charge on advanced vehicle battery technology, and their work is already paying dividends in terms of energy savings, American jobs, and U.S. competitiveness,” said Biggert. She was referring to a manufacturing agreement signed in January by Argonne, LG Chem, and General Motors to make and use Argonne’s patented mixed-metal oxide cathode technology in lithium ion battery cells for the Chevy Volt. The bill also sets aside another $1 billion to give the first 50,000 electric vehicle buyers in each of the 10 deployment communities at least $2,000, beyond existing tax credits or other incentives. In addition, it extends to 2014 federal tax credits for the purchase and installation of electric vehicle charging equipment for individuals (up to $2000) or businesses (up to $50,000 for multiple equipment purchases). Finally, the bill authorizes additional development, deployment and manufacturing incentives for EV technologies, including bond authority and a limited number of smaller grants for municipalities not selected as deployment communities. “The Electric Drive Vehicle Deployment Act will help the nation get off foreign oil and move forward with a comprehensive strategy that helps consumers buy all-electric vehicles powered by wind farms in the northeast and midwest instead of oil from the Middle East,” said Markey, Ranking Member on the House Natural Resources Committee and senior member of the House Energy and Commerce Committee. “It’s time for America to start driving toward a clean, safe energy future, and electric vehicles can help power the way,” he said. “At a time of high unemployment, there’s great potential for job creation in this field and it’s critical that we lay the groundwork now for these new opportunities,” said McNerney, also a member of the Science, Space, and Technology Committee. “With the price of gas rising daily, we have to break our dependence on costly and unreliable sources of oil, and find new ways to power our cars,” said Eshoo, a senior member of the Energy and Commerce Committee. Business leaders and national security experts in the Electrification Coalition, which works to end America’s reliance on foreign oil, say the bill “echoes” their recommendations. “Vehicle transportation is in transition, and we must engage the free market to help bring about this change to eliminate the dangers of oil dependency,” says Andy Taylor, chairman and chief executive of Enterprise Holdings and a member of the Electrification Coalition.